There’s nothing like summer in Minnesota, especially when it involves a Bootleg Cocktail. It’s the perfect way to quench your thirst on a hot summer day. There is something magical about summer in Minnesota. Blue skies, lakes, farmers markets and warm temperatures. It is such a beautiful time (minus the mosquitoes) that I find it difficult to stay inside when the sun is shining. After a busy day of activities, I look forward to relaxing on the patio before dinner. The kids play in the yard and my husband and I have a drink while dinner is on the grill. Pure bliss. One of our summertime favorite drinks is the Bootleg Cocktail. It is fresh, citrusy and the perfect way to use some of the abundant mint in my garden. If I could get everything to grow as well as my mint, my garden would rock! A Bootleg is a cocktail staple at any country club in Minnesota, but no one will give you the recipe. Not even a hint. 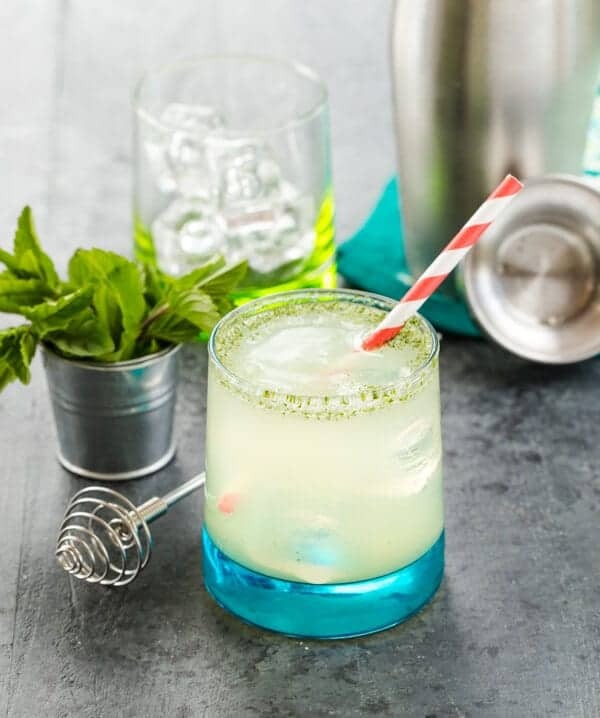 You can guess at the ingredients: lemon, lime, mint, club soda….sounds simple, right? It is – once you get the proportions down (which took us many enjoyable tries. No complaining here!) Like your drinks a little sweeter? Add a little more mix. Prefer them a little drier? Add more club soda or another splash of gin. Gin not your thing? Vodka and rum are great options. The Bootleg is a great way to serve the same drink to many people while being able to add a personal touch to suit their alcoholic tastes. So bring on the patio party and make a batch of bootleg mix to soak up every last bit of time with friends and family. I know we are so ready to enjoy our oh-too-short summer. One of the best things about summer in Minnesota? It makes you forget winter pretty quickly. I’ll drink to that! Make Ahead Tip: Don’t want to mess around with mixing drinks individually? Pour two parts Bootleg mix to one part gin, rum or vodka and mix in a pitcher. Pour over ice and add club soda when serving. 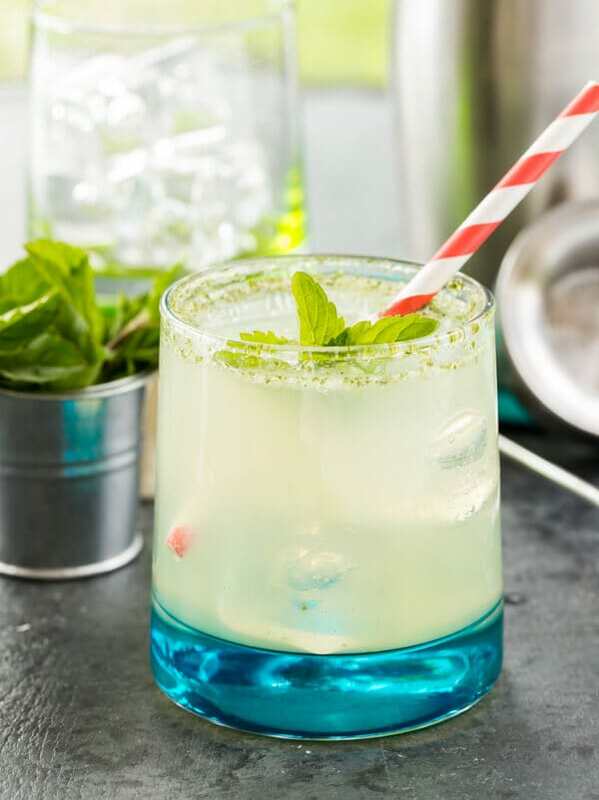 A citrusy, minty Bootleg cocktail that can be made with gin, vodka or rum. Place all ingredients in a blender and blend until mint is chopped finely. Pour into jar and refrigerate for at least 2 hours to let flavors develop. The chopped mint will rise to the top and it settles, I scoop most of it off before mixing the cocktails. Pour gin and Bootleg mix into low ball glass filled with ice. Top with club soda, stir and garnish with mint. Well I love the name that’s for sure. I have to look for this Bootleg mix and the drink sounds amazingly refreshing!!! Hi Cathy, It’s a great refreshing summer drink, so yummy. I’m making them tonight! Have a great weekend! I’ve never heard of this drink before but I MUST try it! It sounds amazing 🙂 Happy weekend, ladies! Thanks, Steph! Let me know what you think! Enjoy your weekend. we also have found that if you briefly freeze the mint leaves they shatter very finely in a food processor. Ooh, Thanks! Will give it a try-love the idea of slightly freezing the mint. Cheers! Oh my…made a batch of the boot leg mix and this certainly trumps the mojitos that have been my summer staple! My boys even enjoyed a ‘virgin’ bootleg while we all sat out on the porch. I like the idea of freezing the mint leaves & will try that next time. Thanks for all of the great recipes – LOVE the site! t has inspired me to get out of my food rut. Hi Lisa, this is probably a stupid question, but I assume you add water to the mix as well right? Hi Gary, Not a stupid question at all! In fact, you do NOT add water to the mix-just use the concentrate full strength. Cheers! Gin is my favorite! I have to make this as soon as I can find some Bootleg. I’ve never heard of it. I love your little whisk too! Hi Suzanne, I make the bootleg mix and then mix 2 parts bootleg mix to one part gin, vodka or rum and keep chilled. Serve over ice and add club soda before serving. Hope that helps. Cheers!